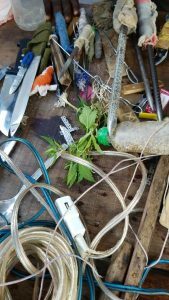 The marijuana plant that the Guyana Police Force said was Found at the Lusignan Prison. A three-hour search of the Lusignan Prison, East Coast Demerara has uncovered, among other items, a marijuana plant. “One small cannabis plant and a quantity of ziplock bags,” were among the listed prohibited items found at the jail. This suggests that marijuana is being grown at that penitentiary. Prior to the destruction of the Georgetown Prison by fire, a raid there had found a bucket of home-made wine. 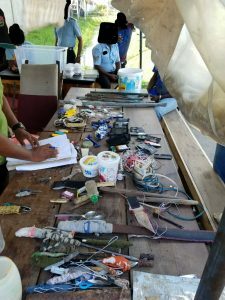 The Guyana Police Force said the search by the Joint Security Services was conducted on Monday. Ø One (1) small cannabis plant and a quantity of ziplock bags.